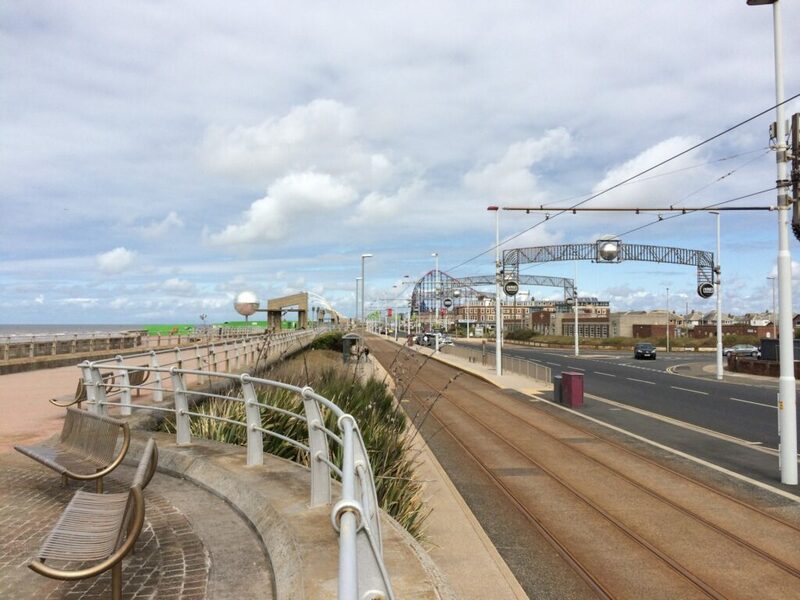 Take a look around Blackpool South Shore – we’re going from Central Pier, heading south past Waterloo Headland and towards South Pier. Then past the Sandcastle and Pleasure Beach, beyond to Squires Gate. 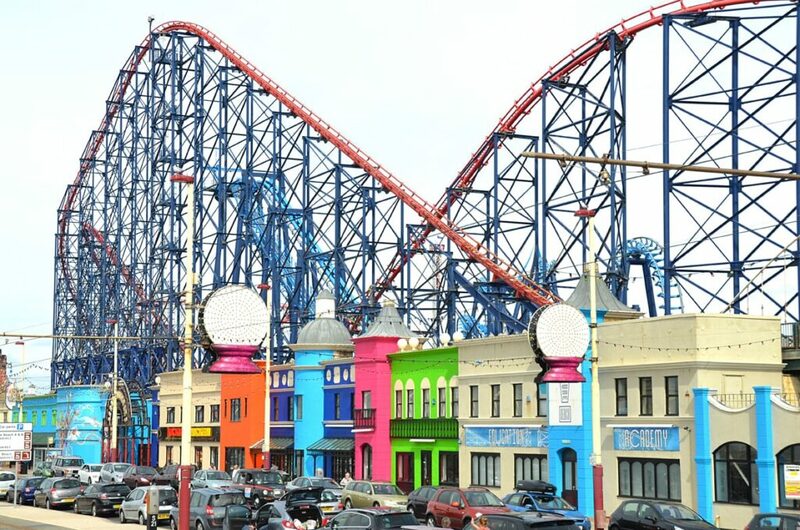 As you know Blackpool is unique in that it has three piers. Central Pier is the one with the huge big wheel. 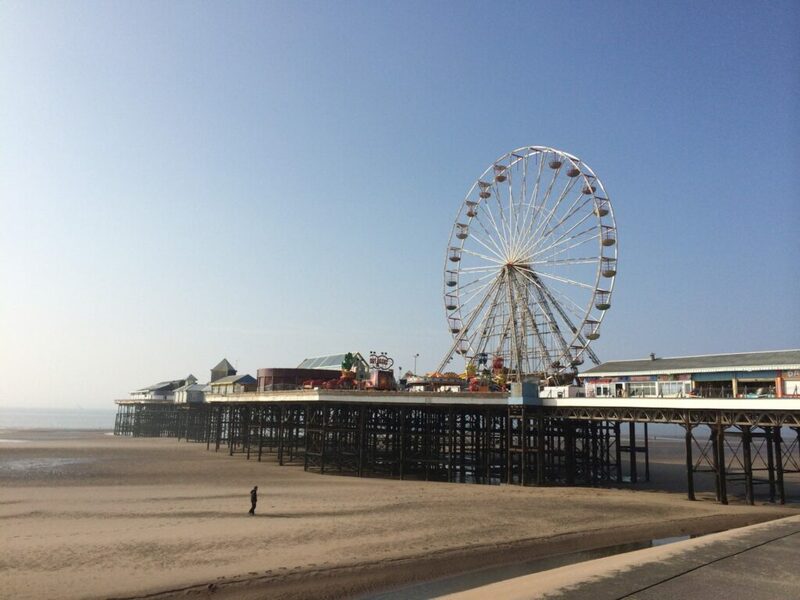 This Pier is the one that’s across from Madame Tussauds and SEA LIFE Blackpool. Carry on southwards and the seafront shops and attractions of the Golden Mile are replaced with hotels and guest houses. 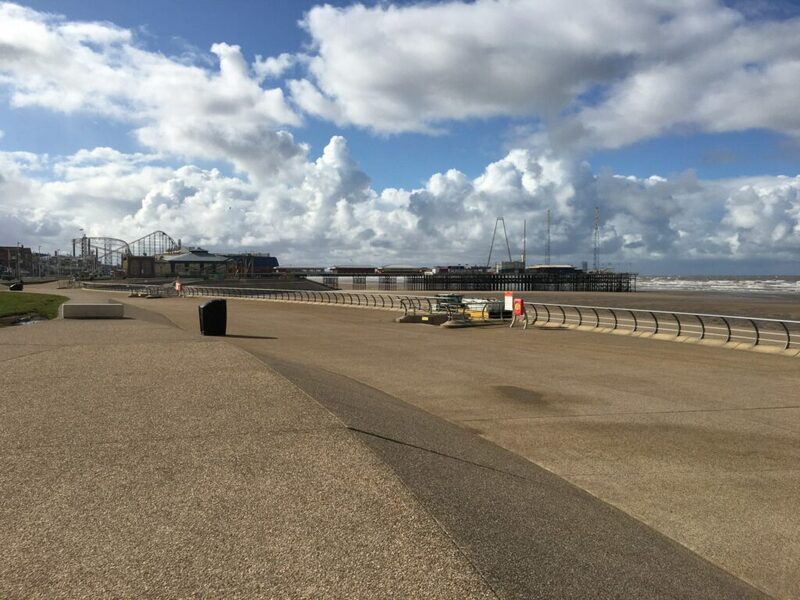 The full length of the seafront at Blackpool has been completely rebuilt in recent years. It was a £100m+ project that was fully completed in 2012. 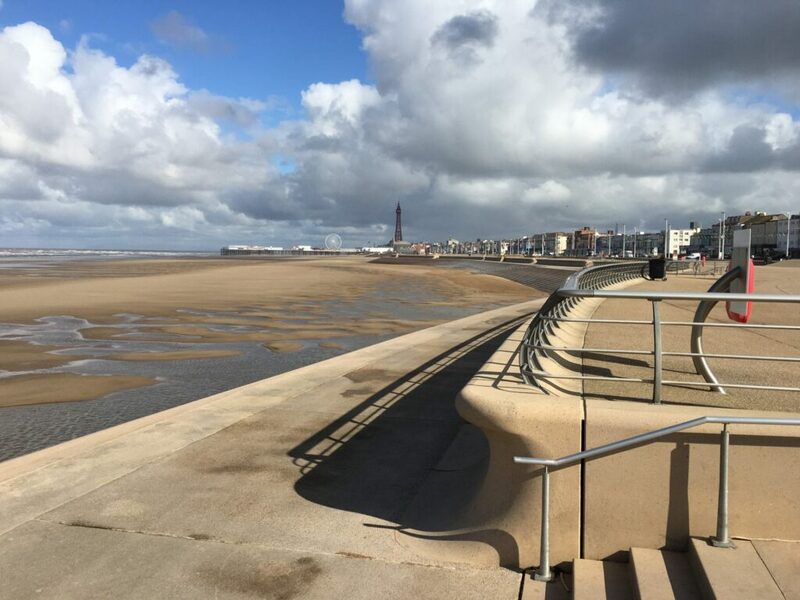 The scheme incorporates revetments that are known as ‘Spanish Steps’ which are designed to sap the energy out of the waves and prevent overtopping. As you stand against the steps and watch the sea bash into them, you can actually see the energy of the waves being dissipated as they climb the stairs. Interspaced with the steps are sections of more traditional sea wall. 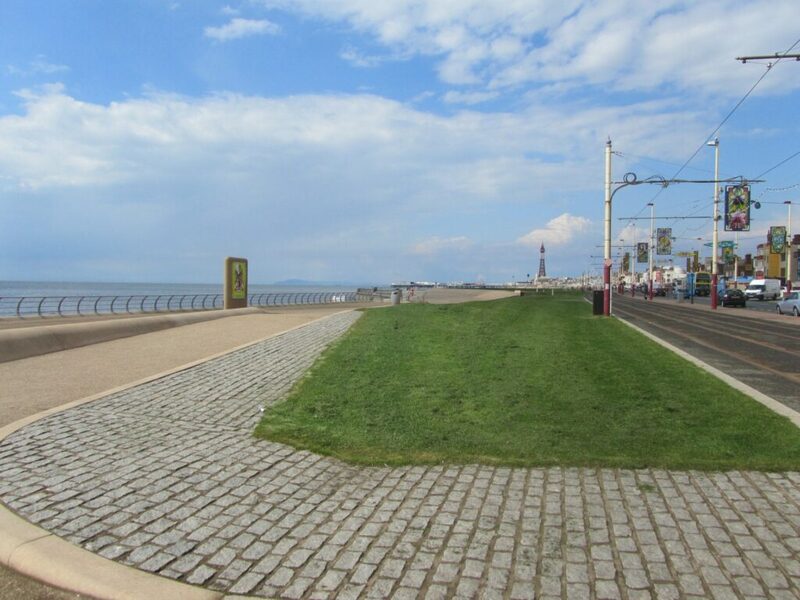 Between the tram tracks and the open pedestrian spaces of the promenade, a grassy strip weaves its way along the seafront. It breaks the promenade up, changes the view and provides places to sit and enjoy good weather. A little further south past Central Pier you come to Manchester Square. It’s not really a ‘square’ at all, rather it’s the forked junction where Lytham Road veers inland from the promenade. It’s where you’ll find the pub of the same name. On Lytham Road, just past the Manchester, you’ll notice that the tram tracks veer left, to the old tram sheds at Rigby Road. 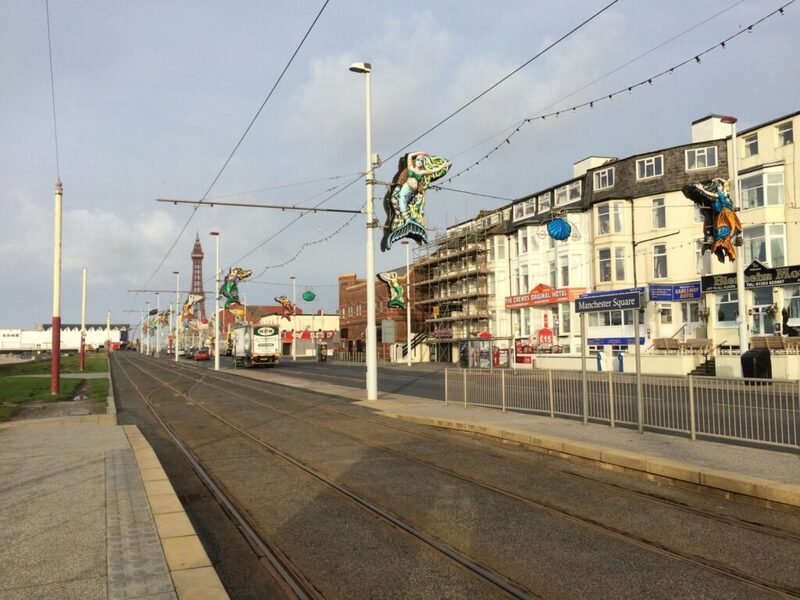 This is where the Blackpool Heritage Trams are kept at Rigby Road. It’s where you’ll see them begin their journeys from. 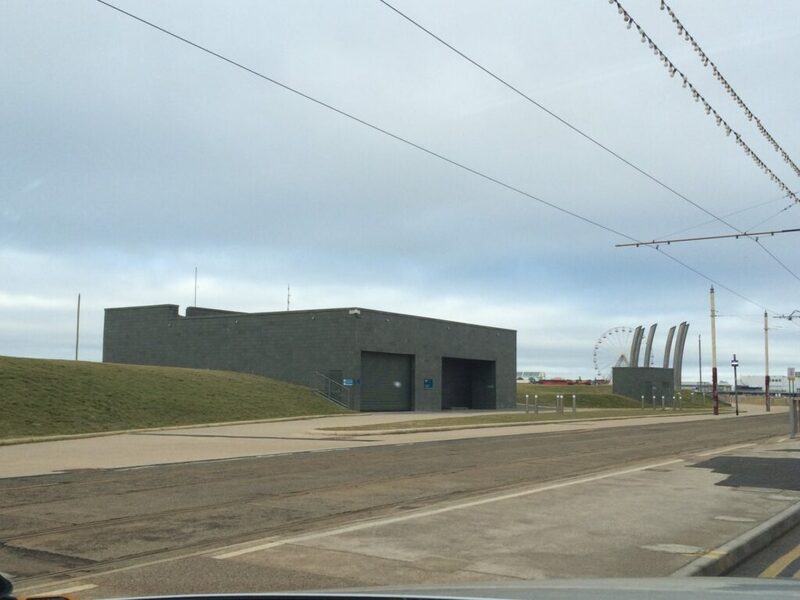 The modern, burgundy Blackpool trams are kept at the new tram shed at Squires Gate. 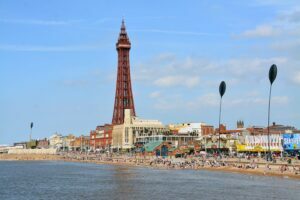 What lies underground at Blackpool South Shore? At Manchester Square you’ll also pass a small building with a series of slightly curved pipes sticking out of the ground next to it. This is a United Utilities pumping station. 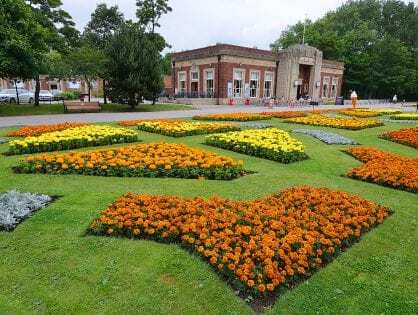 Extensive improvement works have also been carried out at the pumping station in recent years, finished off by landscaping works and improvements to the buildings themselves. The new building is clad in subtle green granite-effect tiles, and the surrounding headland areas lawned with grass which goes around the back of the buildings. Directly underneath here, and along the entire Blackpool seafront, runs a huge mains sewer. 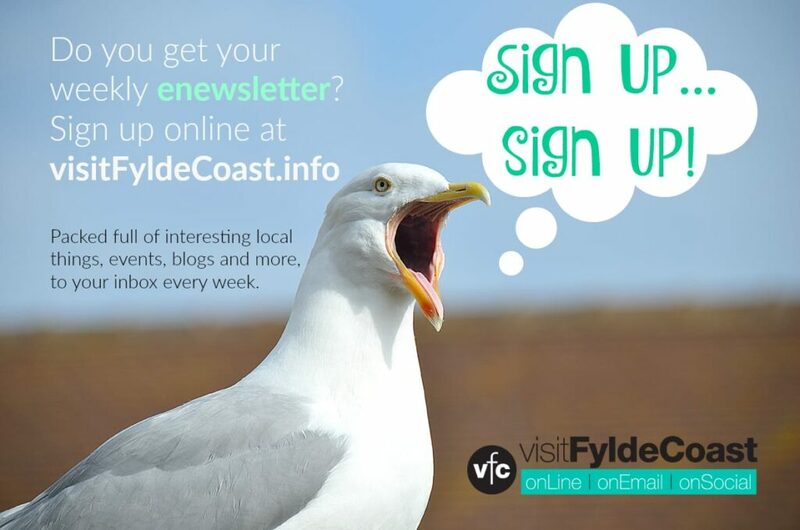 It’s deep underground and carries all of the sewage and rainwater from the Fylde Coast to a state of the art sewage treatment facility at Fleetwood. Do you remember the famous windmill which stood here? It actually used to house the old pumping station before the sewage system was upgraded. You can just see it in this old photo below. There are more old Blackpool photos here. Waterloo Headland is a huge, curved area of land which was created during the sea wall construction works. 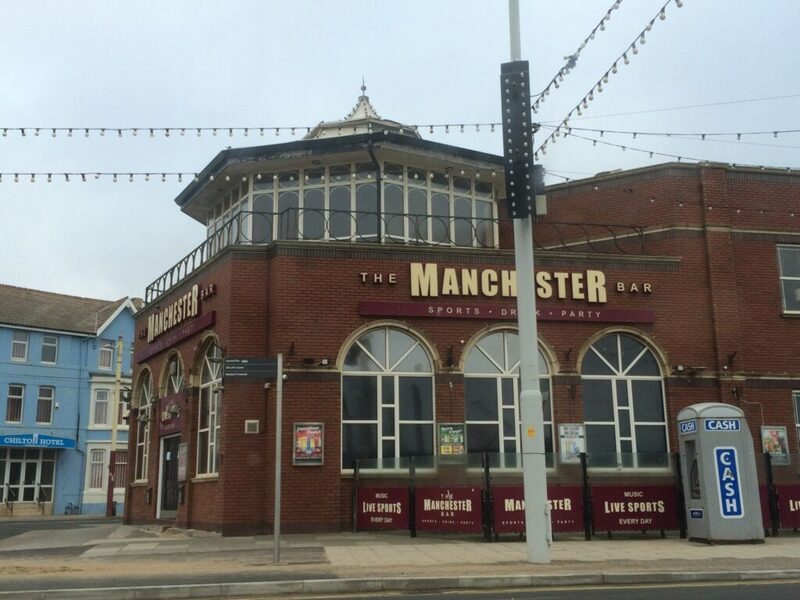 It’s opposite Waterloo Road and Blackpool South Shore shopping area. It’s not easy to see just how big it is from a photo – why don’t you go and explore for yourself? It’s a great big, wide open space.  Perfect for walks in winter or summer, with great access to the beach. 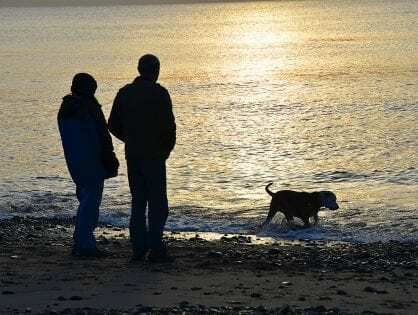 There are more miles of golden sands for you to explore at Waterloo Headland, and more Spanish Steps to sit on, catch your breath and enjoy the views. 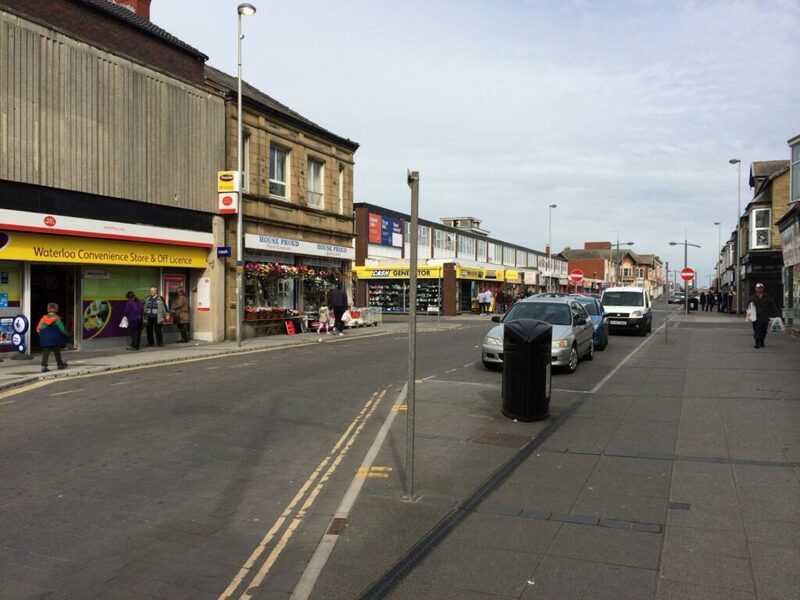 Waterloo Road (pictured below) is just around the corner from Notarianni’s Ice Cream Parlour. 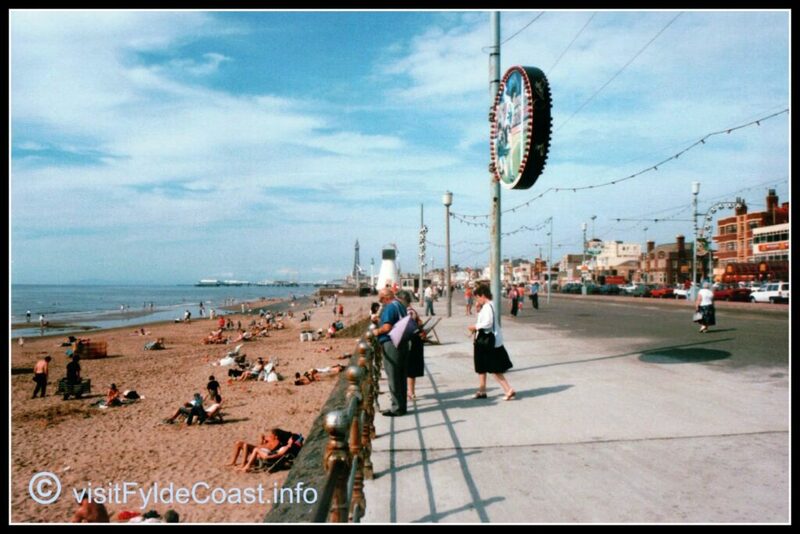 It’s not far from McDonald’s, before you get to South Pier. Always popular with locals and tourists, there are shops here for visitors along with local convenience and food stores and indoor markets. 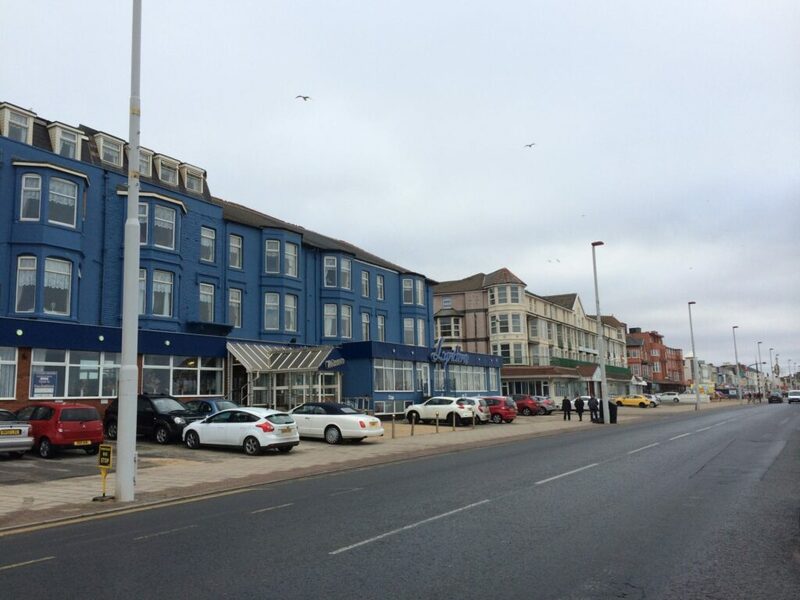 There are seafront hotels and guest houses of different sizes along the promenade, interspaced by some shops, cafes and takeaways. It’s a fascinating mixture of sights, sounds and smells. Your next stop is South Pier. 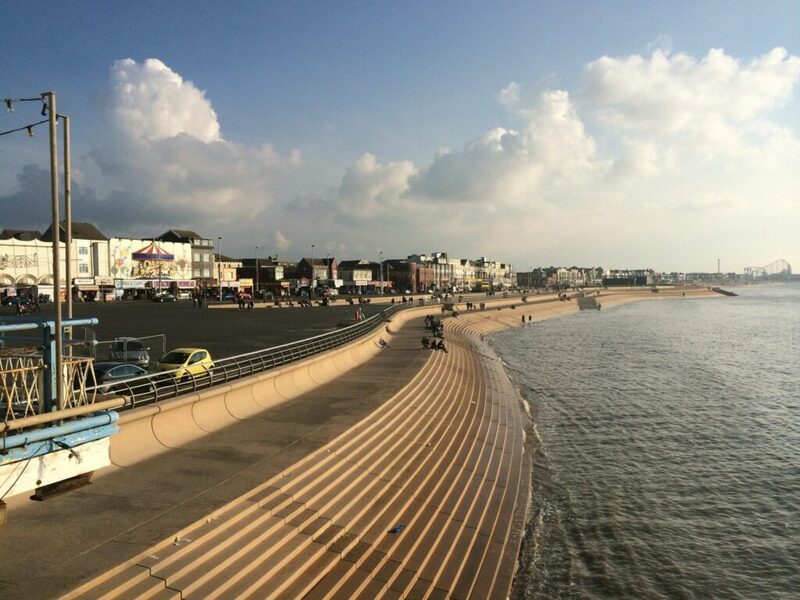 On your journey southwards along the promenade with the sea on your right, you’ll come to South Pier next. 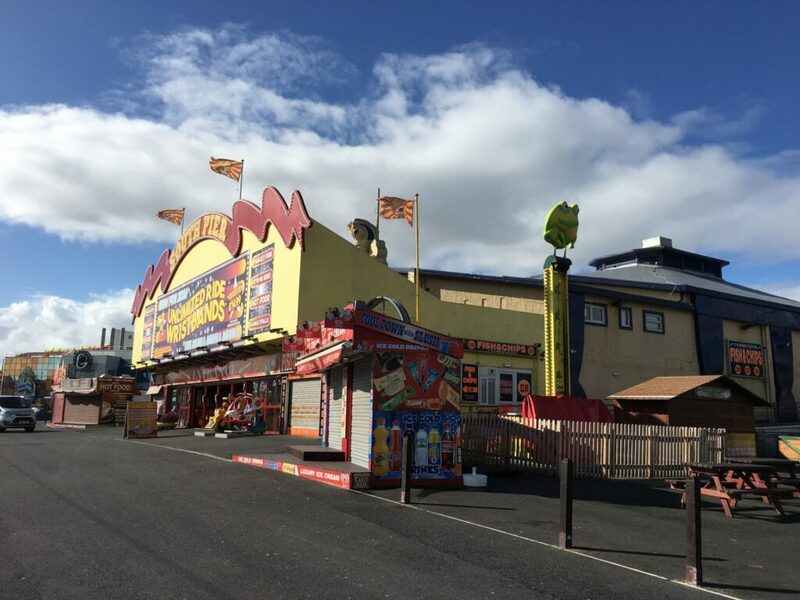 The next door neighbour to South Pier is the Sandcastle Waterpark. There you can enjoy slides and rides whatever the weather! 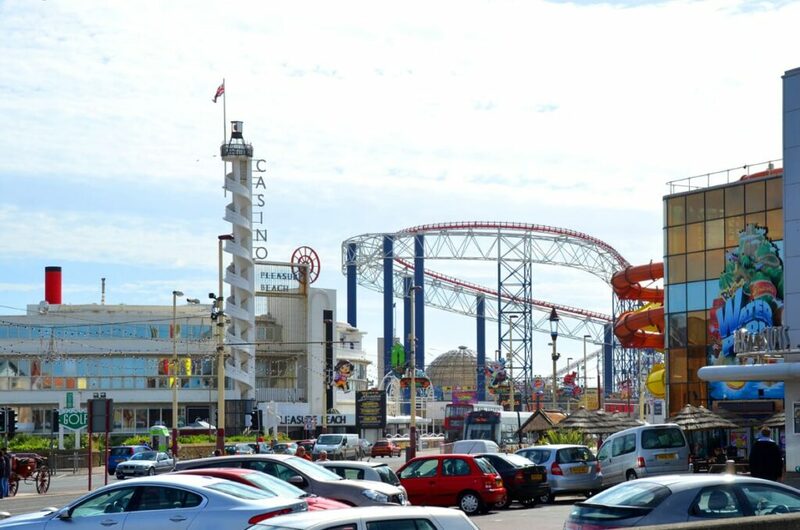 On your left, opposite the Pier and Sandcastle, is Blackpool Pleasure Beach. Continue along the promenade and there’s a row of shops painted in different colours. They’re part of the Pleasure Beach. 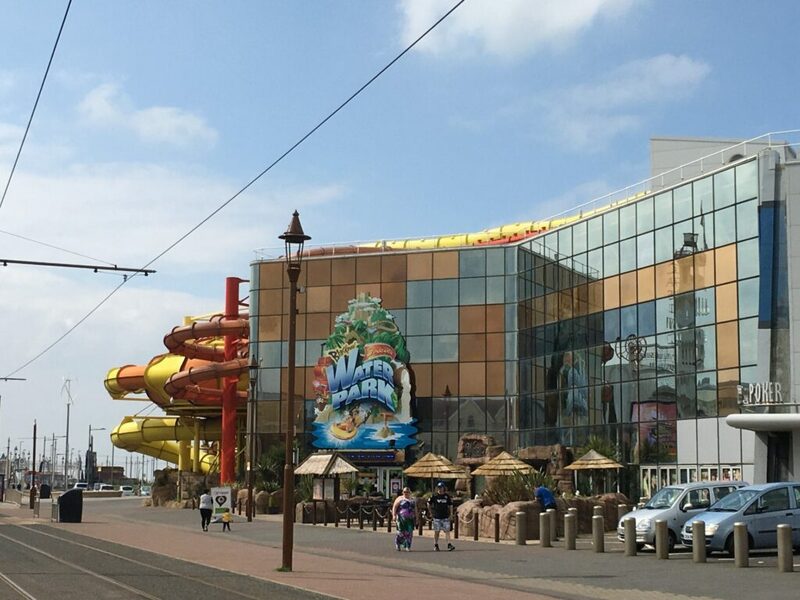 Beyond the Pleasure Beach the seafront changes pace again, giving way to hotels and private accommodation. 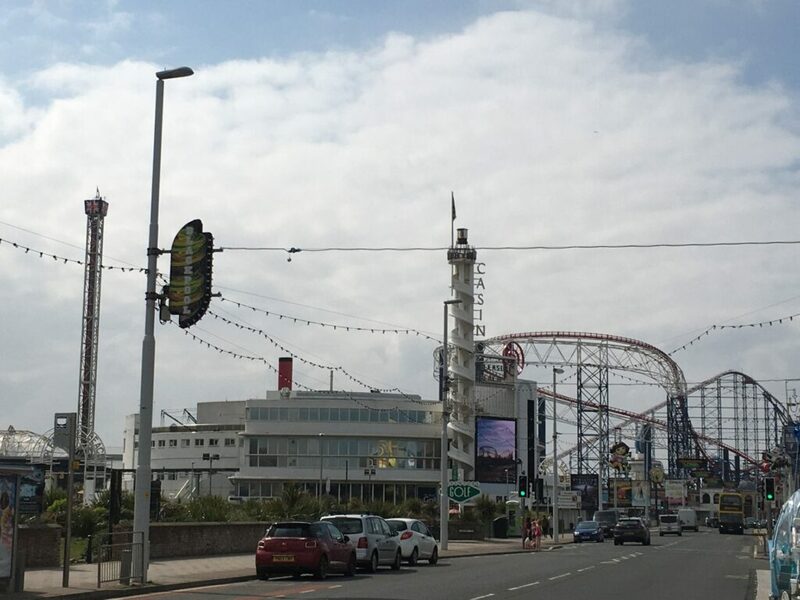 The promenade beyond the bright lights and attractions of Blackpool is wide, flat and open. 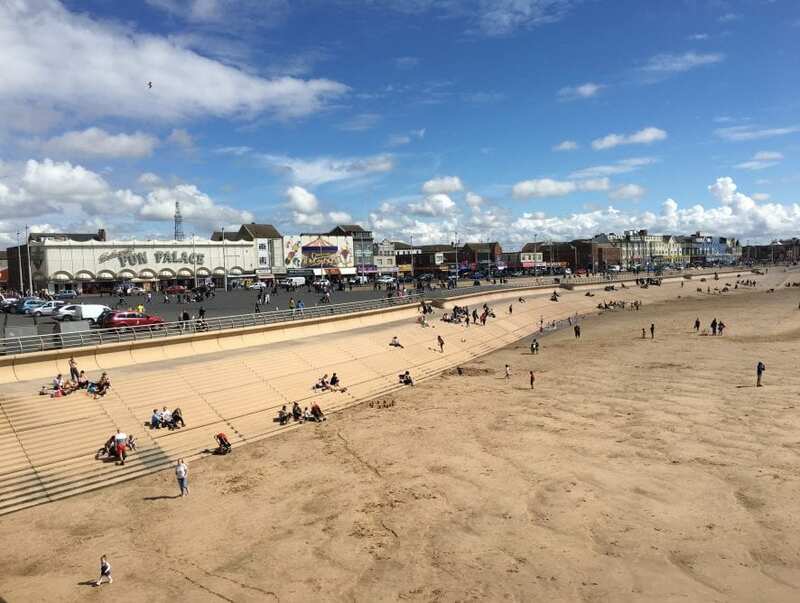 It’s perfect for walking, cycling and enjoying the beach and views. In the area around the Solaris Centre there’s a public art trail for you to explore – the most obvious one is the Mirror Ball. 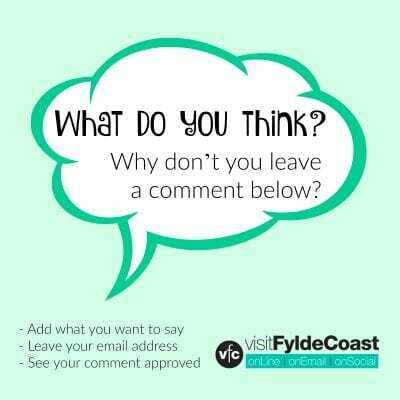 Continue southwards to Squires Gate and the new tram sheds at the bottom of Squires Gate Lane mark the end of Blackpool seafront. 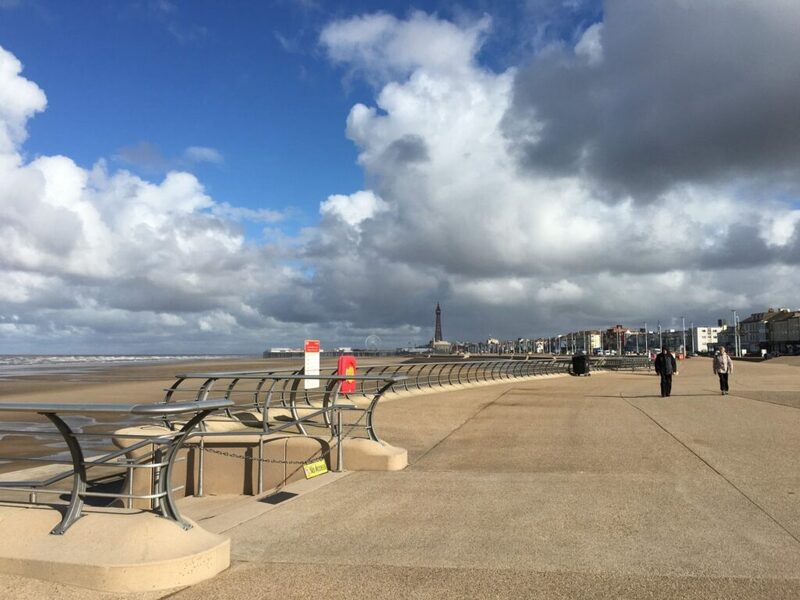 Blackpool meets the boundary of St Annes here and the borough of Fylde. 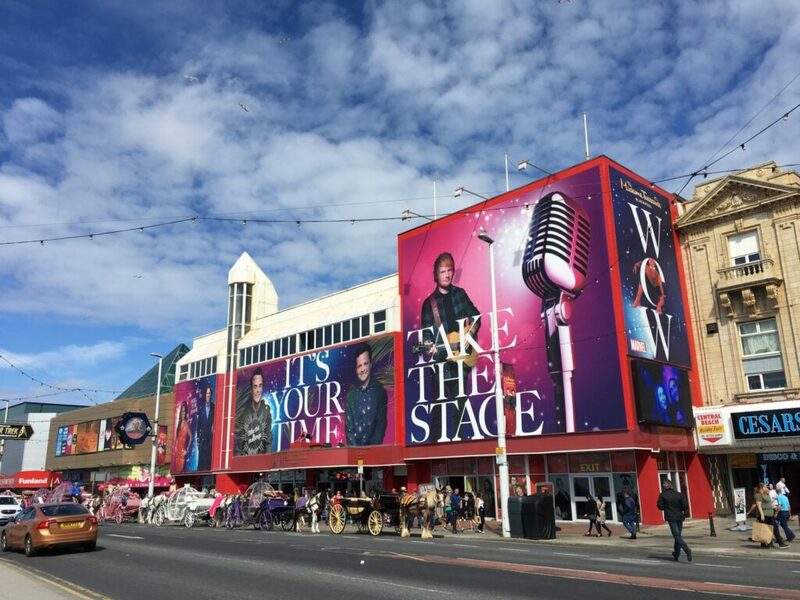 Don’t forget that the whole of the promenade at Blackpool comes to life from late summer until autumn every year, with the Blackpool Illuminations.